I use a moisturizer with sunscreen of SPF30 daily and on scorching summer days where the sun can cause more damage I increase to SPF50. This definitely had helped spots not to get dark. I also avoid spending time in direct sunlight after 12pm. Another “remedy” which I also love which reduces dark marks is making a turmeric mask. I never burst a zit no matter how big or how bad. Have one day a week for my skin to be free, no make up. I def have delayed sun damage but wear a hat and sunscreen under my makeup to prevent more dark spots. I always use sunscreen even on cloudy days. I used to constantly pick my pimples, the end result wasn’t good. 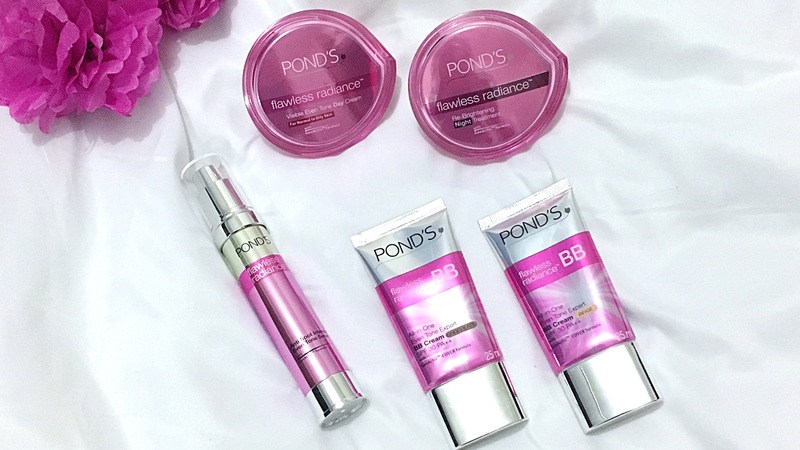 I’ve been using Ponds Flawless day cream for 7mths now, and I’ve seen a huge difference. Unfortunately, I cannot afford the whole range. So I tone my skin with rose water and use my day cream at night too. I stopped picking my pimples. #BeautifulHabits I keep my skin healthy and hydrated to prevent or minimize facial wrinkles. Sun damage is the number one contributor to this sign of aging, so I always wear sunscreen! In addition to sunscreen I use cleansers, moisturizers and other skin care products that are suited to my skin type I never go to sleep with my makeup on. I follow a balanced, healthy diet eating foods rich in omega-3 fatty acids, antioxidants and other vitamins. Most of the time I use soap free cleansers and a good scrub so as to keep my skin moist all the time. I drink at at least 8-10 glasses of water every day. Water gives a natural glow to my skin and keeps it hydrated. I include fruits and vegetables into my every day’s diet. Green Tea Toner – This toner I make at home. When used regularly, it guards my skin against premature aging. The antioxidants present in the green tea soothes my skin when irritated, on the other hand the lemon and mint present in this homemade toner brightens-up my face. I limit my exposure to the sun as much as possible and always make sure I apply (natural) sun cream protection before you do head out to soak in some Vitamin D. I exfoliate once a week. Exfoliation removes the dead skin cells and buff the skin back into good condition. Removing of all the dirt, oil build-up and dead cells leaves my skin feeling baby soft. I can wear less make-up and still feel good about how my complexion looks, and I know that the secret lies in great skincare. Having healthy clear skin has made me more confident, I don’t need to spend hours in front of the mirror covering up blemishes, searching for the right concealers and so on. I have my routine, and I am able to face the day with much Confidence!